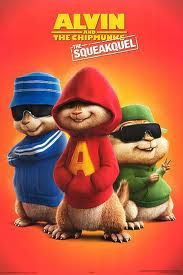 I watch Alvin and The Chipmunks 1 and liking it. I watch it with borrowing CD from CD rental. Funny, I think... less adventure much funny.. when I know they production the sequel too, I'm interest to watching it. But actually I think the chipmunks voice soo sound alike 'Pak Blangkon', one character on Anak Ajaib (unordinary kid) series. That serial turn on television when I'm a elementary school student (time really flight, isn't it?). I watch it from vcd rental on my laptop. since Alvin and the chipmunks more and more popular.. Alvin being self centered, refuse to be a good listener and didn't behave anyway. He didn't hear Dave says and starting underestimate his brothers : Simon and Theodore even he still loving them. alvin's self centered made their relationship messing up. alvin is the direct reason of Dave had a hurt on his whole body. a condition make them live with a boy (and he's so pathetic with his game addiction). so much conflict here, and they're fallin' love too.